Discover a world of sensations with GARDEN SPA. Enjoy the best facilities and let yourself be pampered by a great variety of treatments at the forefront of wellness, health and relax. At Garden Hotels we take care of you through our Garden Spa & Wellness centres. Our main aim is to make you feel the greatest wellness through the most modern treatments and with true professionals who offer you the best counselling and customer services. Let yourself be carried away by a renewing experience in a tailored and customised space. It is definitely the best plan for your holidays by the sea. The well-cared facilities of the GARDEN SPA have been designed to offer you a harmonious and peaceful ambiance. A perfect setting where relax and wellness come hand-in-hand with an exclusive offer of treatments, water circuits and massages. You will be able to enjoy some of the most beneficial therapies for your health, like the aromatherapy, natural exfoliants, body moisturising treatments and thermal circuits. All of them contribute to the improvement of blood circulation, to muscle elasticity, to the reduction of stress and to the release of endorphins, the hormones that reduce pain and improve wellness. With GARDEN SPA you will surely find a world of unique sensations that will help you get a perfect state of balance and vital satisfaction. Pure pleasure for your senses. 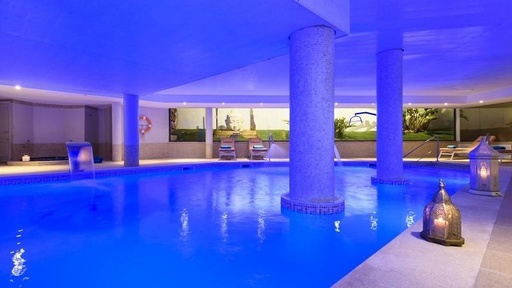 An irresistible temptation we invite you to live in the Gaden Spa & Wellness centres.